Lois and Richard Michel invite you to stay a while at While Away Bed and Breakfast, an exclusive, four and a half star B & B located at Yeppoon on the Capricorn Coast of Central Queensland, Australia. Just 30 minutes drive from Rockhampton this quality accommodation allows you access to the picturesque Capricorn Coast and all its attractions. Whether it be amazing islands, deserted beaches, fishing, boating, the reef or rainforest, Yeppoon and its surrounds can satisfy all your desires. Experience a perfect holiday in a beautiful, exciting part of the world. While Away has beautiful gardens, shady courtyards, wireless internet and is only 100 metres from a lovely unspoilt beach. With a selection of rooms to choose from you will find our piece of paradise most enjoyable. 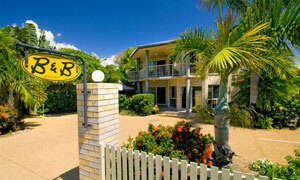 If you are looking for intimate accommodation in the Yeppoon area at reasonable rates why not give us a call.